The way I see it, there's nothing -- short of plastic surgery -- that I wouldn't try for the sake of beauty. (Something about needles and going under the knife just scares me away.) So when I recently heard about the SK-II Whitening Source Intensive Mask, which promised more youthful, radiant skin, I was all for it. Ripping open the package, I discovered an actual mask -- complete with cutouts for eyes, nose and mouth -- that was liberally drenched in a moisturizing but slightly gooey blend of Pitera, antioxidants and vitamins. After unfolding the mask (which I will admit took a bit of work with my treatment-covered fingers), I placed it over my face and left it on for about 10 minutes to see whether it would work. Luckily I was home alone, because I think the sight of a mummy-like mask over my face would have scared the bejeesus out of my roommate! But lo and behold ... upon removal, I literally looked as though I had just come back from a facial! My skin was brighter, tighter and positively glowing, while previous redness just disappeared. Best results should occur if you use the masks every day for 21 days and then twice a week afterwards. Suffice it to say this will now be a part of my daily skincare regimen! It can be a part of your life, too -- simply head to Saks.com and purchase a box of six for $75. This may seem a bit steep -- but how often are you spending upwards of $150 on a facial? Seems to me this is most definitely the way to go. Thanks for the review! :) I got a box of this product as a gift, and I'm really excited to finally use it! But, I don't remember when I got this and I am not sure if it has already expired. Do you know where the expiration date is located? I see a number on the box as well as on the individual packages, but it doesn't resemble a date to me. The mask is tinted slightly yellow and quite gooey/chunky...is this normal? I'm afraid to use it because it may have already expired....Thank you for your help! Hi Anonymous -- I would definitely not use the masks if they look gooey and chunky. 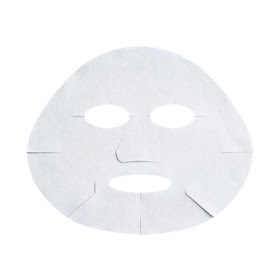 The mask should be clear or pale white. I'm not sure where the expiration date is located, but I would definitely toss these!